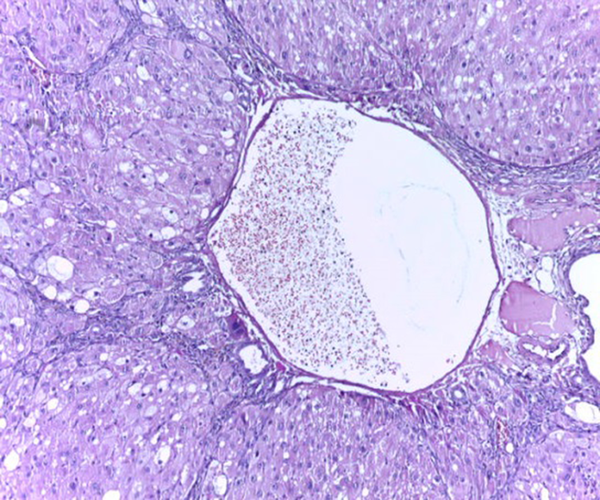 To Cite: Shahraki M R, Mirshekari H, Badini F, Arab M R, Shahraki E. Study of Protective Effects of Gold Nano Particles on the Liver Toxicity Induced by Carbon-Tetrachloride (CCl4) in Male Rats, Zahedan J Res Med Sci. 2017 ; 19(7):e9293. doi: 10.5812/zjrms.9293. Background: Since gold nanoparticle (AuNP) has shown anti-oxidant activity, this study was designed to assess the effect of AuNP on the liver toxicity induced by Carbon -Tetrachloride (CCl4) in rats. Methods: A total of 36 Wistar-albino male rats, weighing 200 - 250 g, were randomly split into three groups (control, CCl4 and CCl4 + AuNP; n = 12) after 5 days of accommodation. 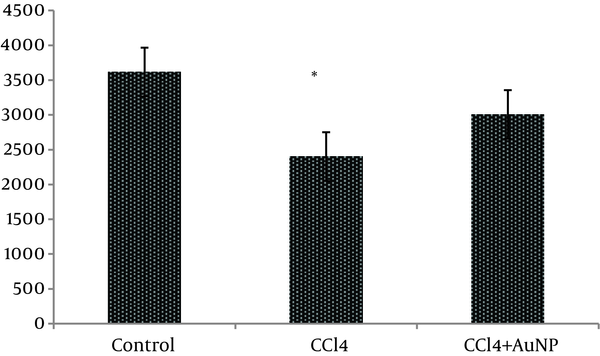 Groups CCl4 and CCl4+ AuNP as experimental were injected with CCl4 (1 mlL/kg b.w) for a period of 42 days intraperitonealy (ip), while control (c) group received saline intraperitonealy. On the seventh week of the study, group CCl4+ AuNP received additional AuNP and saline suspension for a period of three days. Finally, blood samples were collected from their cervical vessels. Liver enzymes activity, superoxide dismutase (SOD), catalase and malondialdeide (MDA) were measured in serum. 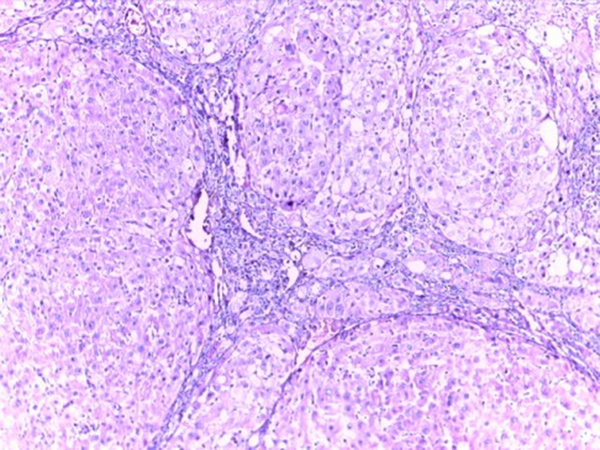 Prepared sections of liver specimens were stained with H and E and PAS methods for histological studies. The data was analyzed by SPSS v. 17; applying one -way ANOVA, Tukey as well as nonparametric tests. Results: Results showed that aspartate aminotransferase (AST), alanine aminotransferase (ALT) and Alkaline phosphatase (ALP) in groups CCl4 and CCl4+ AuNP significantly increased compared to group control, but MDA and SOD values decreased compared to group control. Liver enzymes values did not show any differences in Group CCl4 and CCl4+ AuNP but MDA and SOD values in group CCl4+ AuNP decreased and increased respectively in comparison to group CCl4. Histological evaluation showed fatty metamorphosis and micro nodular cirrhotic changes in CCl4 group but gold nanoparticles did not show a remarkable protective effect. Conclusions: AuNP administration affected MDA and SOD in hepatotoxicity induced by CCl4 in male rats but did not improve liver enzymes damage. Liver damage is accompanied by modern eating habits, many environmental contaminants, and exaggerating consumption of syntheticmedicines. CCl4 is a chemical toxin which causes liver toxicity . In addition, liver cells and microsomes display the central role for different drug metabolism and excretions . 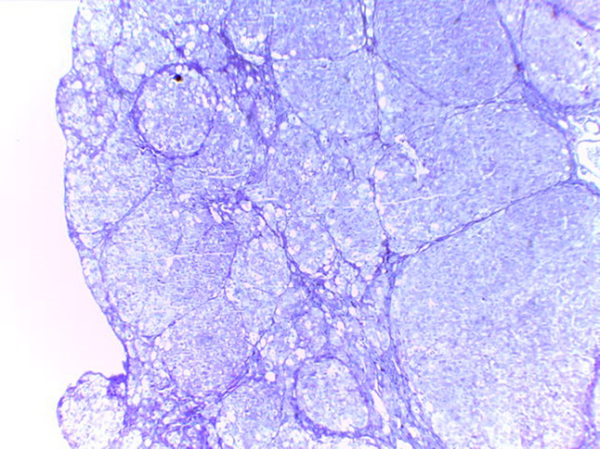 The critical effect of Carbon Tetrachloride is morphological alterations in liver cells . 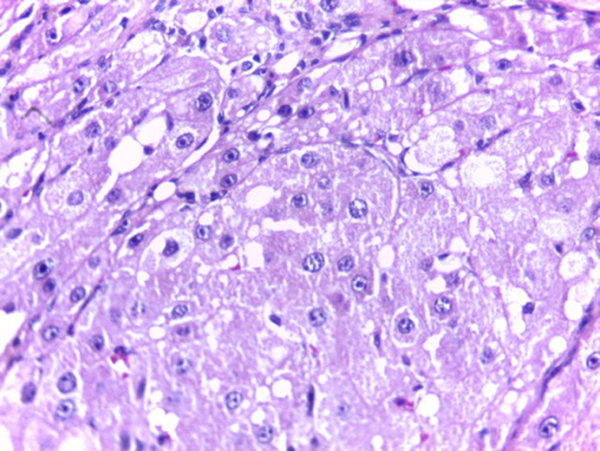 Exposure to hepatotoxic compounds may affect the tumor necrosis factor-alpha (TNF alpha) expression in many acute and chronic liver diseases, and promote the damages of hepatocytes . The classic toxicity of CCl4 speeds up liver injury and liver fibrosis. Liver fibrosis is a result of chronic liver injury, which can progress into liver cirrhosis . Since AuNps have hydrophilic and hydrophobic nature, they easily inter cells and alter the cell function but their effects depend commonly on the size of this nanoparticle [6, 7]. In addition, the volume of the NPs plays an important role in diffusion process of particles in the attachment process . Gold nanoparticles are actually used as drug distribution mediator  and are actually used in food improving industry, and diagnosis and treatment of cancer (10). In addition, Siddiqi NJ (2014) reported that administration of gold nanoparticles in rats causes increased superoxide dismutase (SOD) and antioxidant enzymes activity in liver . Connor E.E. et al. (2005) found that gold nanoparticle administration in human did not show any toxicity despite being taken up into cells . Moreover, the experiment revealed that gold nanoparticle injection into rats from tail vein distributed in various organs such as brain, lung, liver, heart, kidney, blood, testis and thymus but did not show any toxicity . Gold nanoparticles are usually used in food packaging, drinks, toothpaste, cars, and lubricants . Umair M, et al. (2016) considered that nanoparticles of gold are observed as biologically inert . Nanoparticles (NPs) have specific properties which make them suitable for imaging, therapy, and drug delivery . According to the above mentioned report  and since gold nanoparticle of AuNP has shown anti-oxidant activity, this trail was designed to assess the antioxidant effect of AuNP on the liver toxicity induced by carbon -tetrachloride (CCl4) in male rats. A total of 36 Wistar-albino male rats, weighing 200 - 250 g, were randomly split into three groups (control, CCl4 and CCl4+ AuNP; n = 12) after 5 days of accommodation. Groups 2 and 3 as experimental were injected with CCl4 liquefied in fluid paraffin (1 mL/kg b.w) for a period of 42 days intraperitonealy (ip), while control group (c) received saline intraperitonealy and also fluid paraffin (1 mL/kg body weight) subcutaneously every other day in trial period [16, 17]. On the seventh week of the study, group 3 received additional colloidal suspensions of 20 nm gold nanoparticles (AuNP) intraperitonealy, repeatedly administered in saline solution at dose levels of 90 µg for three days . All animals had free access to water and food during the trial period and were sustained in a room at 23 ± 2°C temperature of fixed 12: 12-hours synthetic light/dark period (6 am to 6 pm), with humidity of 45% - 65%. Hepatotoxicity in groups CCl4 and CCl4+ AuNP were induced by subcutaneous injection of CCl4 liquefied in fluid paraffin (30% solution), in a dosage of 1 mL/kg body weight, for 6 weeks. Finally, after overnight fasting (12 - 13 hours), the animals were anesthetized with diethyl ether and decapitated; immediately afterwards, blood samples were collected from cervical vessels. At first, a section of blood samples was collected in CBC (complete blood count) tub which were coated by EDTA for SOD measurements. Serum was separated from remaining blood samples and stored at -70°C for further analyses. Activity of serum liver enzymes of ALT, AST, Lactate dehydrogenase (LDH), and ALP was measured blind applying standard methods using Pars Azmon kit Iran. Finally, the animal’s liver was dissected out, immediately washed with tap water, and fixed in formalin saline10%. Afterwards, according to routine methods in pathological Lab. 6 µ sections were prepared and stained with H and E and PAS methods. These animal experiments were all carried out in accordance with recommendations from the declaration of Helsinki and internationally conventional standards for the utilization of experimental animals, and received ethical authorization from the committee for animal research of Zahedan University of Medical Sciences (project No7355). Data were collected in specific table and their normal distribution was permitted by Kolmogorov-Smirnov test, and was analyzed by SPSS v. 17; applying one -way ANOVA, Tukey as well as nonparametric tests. Obtained results were shown as mean ± SD. Statistical alterations were painstakingly considered significant at P < 0.05. The obtained results indicated that liver enzymes activity of ALT, AST and ALP in groups CCl4 and CCl4+ AuNP, which received CCl4, significantly increased compared to control group; however, no significant differences were observed between groups CCl4 and CCl4+ AuNP (Table 1). Lactate dehydrogenase (LDH) value significantly increased in group CCl4+ AuNP compared to group CCl4 but did not show any significant alterations in comparison to control group (Table 1 and Figure 1). In addition, malondialdeide (MDA) in groups CCl4+ AuNP and CCl4 significantly decreased compared to control group; however, between the two experimental groups (CCl4+ AuNP and CCl4) significant differences were not observed (Table 1, Figure 2). Moreover, superoxide dismutase (SOD) value in group CCl4+ AuNP significantly increased compared to group CCl4 but did not show any significant differences compared to control group (Table 1, Figure 3). aBased on ANOVA and Tukey tests, AST, ALT and ALP in CCl4 and CCl4+AuNP groups significantly increased compared to control group but these values did not show any significant differences between CCl4 and CCl4+AuNP groups. n = 12. 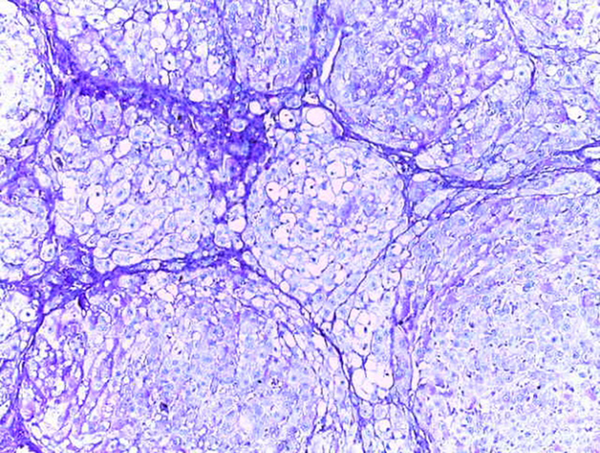 Histological studies showed fatty metamorphosis and micro nodular cirrhotic changes in the experimental groups which received CCl4 injection; furthermore, there were prominent gross pathological changes in liver surface, including loss of smooth appearance of hepatic capsule. Findings revealed that nanoparticles had no prominent protective on hepatocyte in the experimental groups. It seems that CCl4 induces so many pathological changes in liver parenchyma and vascular elements including sinusoids (micrograph 1 - 5). Liver injury is always correlated with cellular necrosis, which increases lipid peroxidation (LP), and reduces malondialdehyde (MDA) and glutathione (GSH) content linked with elevated liver enzymes . Carbon tetrachloride (CCl4) is a xenobiotic which is the leading cause of severe liver damage throughout its bio activation to trichloromethyl free radicals causing LP and producing hepato cellular damage [20, 21]. The results of the present study indicated that serum level activity of ALT, AST and ALP in the groups CCl4 and CCl4+AuNP which received CCl4 in trial period significantly increased compared to control. In addition, Lactate dehydrogenase (LDH) value in group CCl4+AuNP significantly increased compared to CCl4 but did not show any significant differences compared to the control group. Moreover, the MDA rates in group CCl4+AuNP and CCl4 significantly decreased compared to the control group. Our findings revealed that blood superoxide dismutase (SOD), in group CCl4+AuNP significantly increased compared to CCl4, but did not show any significant differences compared to the control group. The results in the present study showed that the serum liver enzymes activity (ALT, AST, and ALP) significantly increased in the groups which received CCl4. This section of the results is consistent with the findings by Ahmed A. Elberry, et al. (2010) who reported that CCl4 is an important toxin which prompts liver injury by elevating serum levels of liver enzymes such as ALT, AST, ALP (16) and also reported the severity of liver damage . Our results revealed that AST, ALT and ALP in group CCl4+AuNP did not show any significant differences with those of group CCL4 and are then in in line with the findings by Clinton Rambanapasi, et al. (2016) who reported that the indicators of liver damage, AST and ALT showed no significant differences between the control and experimental groups . The results in the present study were promised by Shu Dong, et al. (2016) who reported that toxicological mechanisms of CCl4 -induced liver fibrosis may be related to multi biological manner mechanisms for CCl4 detoxication in the liver . Poli G, (2000) reported that fibrotic process in the liver, which is induced by chemical mediators, promotes expression and synthesis of inflammatory and pro-fibrogenic cytokine and lipid peroxidation products . In addition, our results showed that MDA values in group CCl4 and CCl4+AuNP significantly decreased compared to the control group and are consistent with the findings by Poli G (2000) who reported that chemical mediators stimulate lipid peroxidation products . Our results also showed that pathological changes due to CCl4 injection, including fatty metamorphosis, cirrhotic changes and vascular congestion and dilatation are part of complex toxic effects of this organic compound which had a little hepatic protective effect on morphology and function of liver cells. Barathmanikanth S. et al. (2010) found out that gold nanoparticles inhibit the ROS generation at hyperglycemic conditions; scavenging free radicals and preventing oxidative stress in streptozotocin induced diabetic mice . Our findings in the current study, furthermore, revealed that superoxide dismutase (SOD) in group CCl4+AuNP significantly increased compared to CCl4 which was in agreement with those of Siddiqi NJ. (2014) who demonstrated that gold nanoparticles administration in animals changed the expression pattern of SOD activity in various tissues. For example, maximum SOD activity was detected in liver and minimum in spleen . Besides, Abdelhalim MA, et al. (2015) reported that administration of 10 nm AuNP for exposure duration of 3 and 7 days in rats caused a significant decrease in SOD levels in specimens of liver  compared to that of control which is inconsistent with our findings. These differences may be due to animals’ model and size of gold nanoparticle. Our findings in the present study revealed that AuNP administration in liver toxicity induced by CCl4 in male rats affected blood SOD and MDA values but did not show any changes in serum liver enzymes activity. In addition, AuNP did not show any protective effects against induced fatty metamorphosis and cirrhotic changes in experimental group. This study was financially supported by the deputy research center at Zahedan University of Medical Sciences (project No: 7355). We are grateful to Dr Ali Reza Nakhei for his kind cooperation. Authors’ Contribution: Mohammad Reza Shahraki, Hamideh Mirshekari and Mohammad Reza Arab developed the original idea, protocol and wrote the manuscript. Fereshteh Badini collected the data and other authors, analyzed the data. Funding/Support: Zahedan University of Medical Sciences.